Hello. Hope your Thursday is going well. Today's card is the other image that was offered for a donation for the Find a cure 4 Menengitis. See my Tuesday post for information. I love this little sailor and his dog. It's a pretty simple card, I kept setting it aside and wanting to add more to it, but nothing seemed to work, so I finally just left it alone. I stamped the stars and swirls with versamark watermark ink onto a piece of blue cardstock. The image was printed on linen cardstock and mounted onto a piece of deckle edge tan paper. Hi here Sue -- I hope you are having a great day too! This is adorable and though you say this is "pretty simple" -- it is simply pretty and doesn't need another thing. Gorgeous job just as it is - I know how tempting it is to add more to boys cards - but it never seems to work! 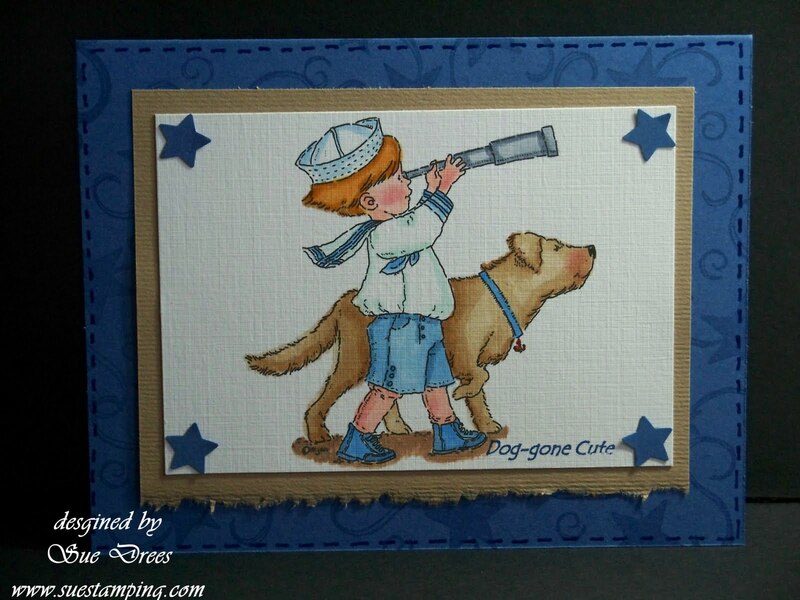 I adore Mo's little boy images...you have made a great card here!